When it comes to service providers, employers and insurers should be aware of the many credentials ergonomic specialists are putting after their name. There are vast differences in the ergonomics certifications offered in today’s marketplace resulting in significant differences in skills, experience, knowledge, and expertise. Following the 1997 Cal-OSHA ergonomics regulation and the push for better health and wellness in the workplace, sit to stand trends in the office, and other legislative changes supporting individual’s abilities to work in comfort, have made ergonomic services extremely popular and competitive - especially in California. In addition, many perceive (office) ergonomics as something “easy” to do as a startup business or an add-on service. In reality, this is a professional career path that requires substantial education and training. Matching the right ergonomics professional to an organization's needs is critical to assure a successful outcome when designing a new technical process such as an assembly line or production area, setting up an ergonomics process, integrating ergonomics into facility planning, or returning an injured worker with a medical condition back to work. Employers need to be sure they engage with a certified professional ergonomics consultant who can provide them with the appropriate evaluation and solutions for the desired results. With so many people “dabbling” in ergonomics, it’s time to clear up all the confusion. Aside from earning a Master’s Degree in Human Factors and Ergonomics, there is no state or national licensing body at this time to credential Ergonomists. Only nationally recognized board certification organizations (non-profit) or privately held, “for profit” credentialing businesses. The table below lists the most popular certification programs available in the market today. It is not an all-inclusive list. Each program listed offers varying lengths of training, testing, and submission of work to demonstrate competency to become certified. Ergonomics is an applied science, so people with degrees in healthcare, engineering, psychology and other non-degreed backgrounds can be certified. The most respected and highest level of certification achievable in ergonomics is awarded by the Board of Certified Professional Ergonomists (BCPE) followed by Oxford Research Institute (ORI). Both of these are national boards with national and international recognition. Becoming certified is evidence of a minimum level of professional competence, but demonstrating the necessary competence has significant variability depending on the credential selected and ergonomics experience of each individual. 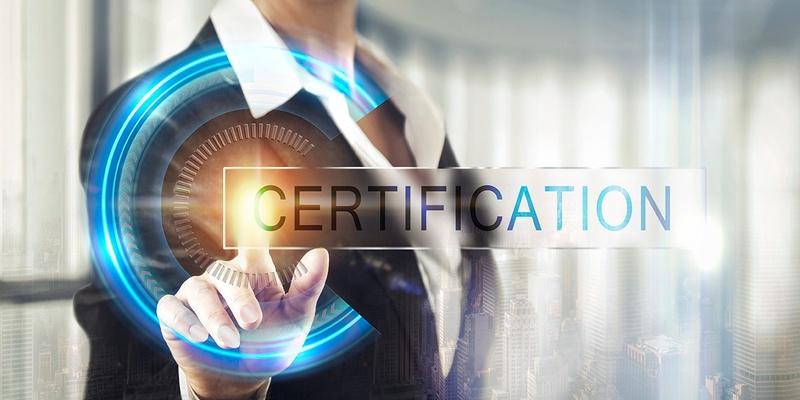 While certification is important to advance the credibility of a profession, employers should be mindful of what each credential brings. When comparing and selecting an ergonomics service provider, select the most qualified and experienced professional needed for the ergonomics project to assure the most successful outcome. Be wary of the “alphabet soup” of ergonomics service providers. 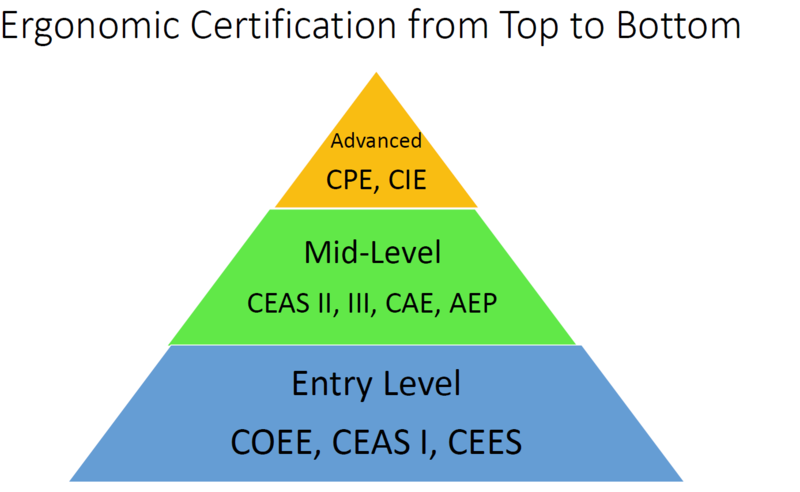 Selecting a CPE or a CIE assures employers and consumers they are working with a professional who has met the most rigorous standards available. In particular, the BCPE requires applicants to possess an advanced degree in a related field such as engineering, human factors, industrial psychology or physical therapy. These agencies also offer a more mid- level credential such as the AEP or CEA. The remaining five (5) entities are private business certifications. Essentially, these certification courses are open to anyone who is interested and pays the entrance fee. Certificates are earned by attending a one or two day workshop and completing a minimum level of acceptable testing and reporting. These programs essentially offer entry level certifications, like a freshman in high school. These include the CEAS I, CEES, and COEE. Worksite International’s DIY Train the EvaluatorSM workshop is provided by a highly trained, experienced and qualified professional (Alison Heller-Ono MSPT, CDA, CASp, CIE and CPE), credentialed with the highest level of national board certification possible with an accompanying healthcare degree. It offers participants coursework to learn basic office ergonomics theory and skills to conduct an evidenced-based office ergonomics evaluation. In addition to passing a brief exam at the end of the one-day course, participants must complete two ergonomic evaluations using the Worksite International System of office ergonomic analysis. All certification candidates are mentored for a minimum of 30 days to assure a successful outcome as a Certified Office Ergonomics Evaluator (COEE). If you'd like to learn more about ergonomic certifications and credentials, contact us anytime.